Vivid Seats, North America’s largest independent marketplace for everything entertainment, is more than just a great experience. They’re also obsessed with data. Their talented data team, gifted engineers, and skilled designers created a look at the most popular MLB teams in each state in this vivid visualization. This project and others, like the October 2018 Most Popular Music Genre and Artist in Every New York City Neighborhood are perfect examples of how visualizations can tell a story. Through their unique buying and selling ecosystem, they learn a lot about their users — what they like, what they watch, what they’re interested in. But on a spreadsheet, it’s flat. Vivid Seats wanted to bring their user stories to life. With their proprietary data and Mapbox, Vivid Seats feels they’ve finally found their sweet spot with mapping data visualizations. 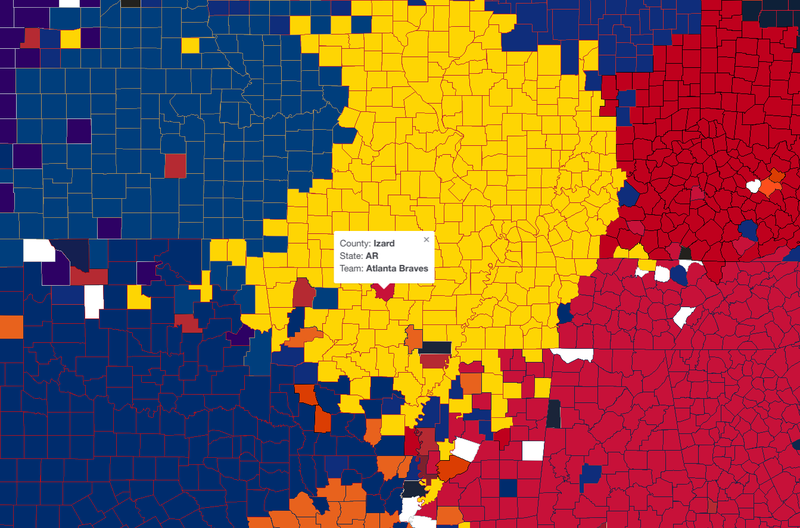 The map explores America’s rooting interests by identifying the most popular MLB team in each county. It is based on Vivid Seats’ ticket data from 2018-present and excludes spring training and postseason ticket sales. They accomplished this by overlaying their data on top of our map and drilled down to state and postal code level boundary data. Then, they shaded in with the color corresponding with that county’s most popular team. A lonely island of Braves fans in a sea of Cardinals fans. 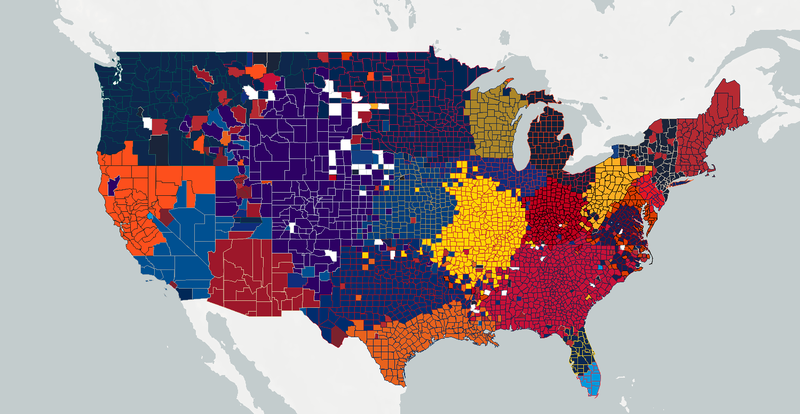 With over 459 counties, the Braves can easily claim the most popular team in the US — possibly due to their television fame, or relative lack of competition in the South. The Oakland A’s are the only team without at least one county on the map. Explore the map for yourself to see how your team is represented. Ready to bring your own data to life? Talk to our team.